Fitness has now become something we often incorporate into our daily routine. Whether it’s going out for a run first thing in the morning, or hitting the gym during our lunch breaks, a running backpack will allow you to keep your essential belongings on you when combining your work day with your workout. If you have a long commute, then any less than a 12L capacity backpack isn’t going to cut it- especially if you want to carry a laptop. Look out for backpacks with dedicated compartments for all your daily essentials. If you prefer to run super early or leave the office late at night, reflective detailing will make sure you’re visible in urban environments and waterproofing will protect your gadgets in even the most unpredictable weather. What about the best massage tools? Competitive runners should opt for no more than 10L is advisable so that it doesn’t slow you down and allows for ease of movement. Make sure it has an integrated or designated space for a hydration pack, too, for when you need to re-fuel on the go. Here we bring you up to speed with our top 7 backpacks for an easy work out on the go. 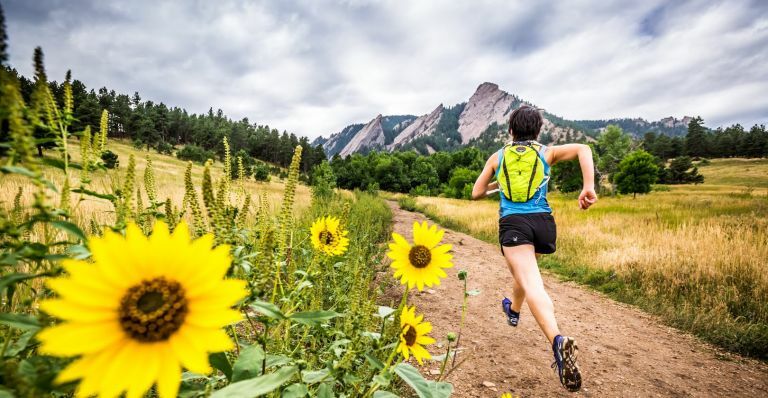 The OMM Phantom 12 makes our top spot because of it’s super lightweight feel and expandable capacity, making it by far one of the best running backpacks for everyday use. Whether you’re on your daily commute or running in a race; this backpack will serve you well and you won’t even know it’s there with its incredibly adaptable 6-point harness. With a 20L capacity, the Salomon Trail 20 Backpack may sound too big, but it is a comfortable way to pack everything you need for your day. It is not waterproof so we do not recommend it for long outdoor walks but this is one of the best running backpack for commuting through a city because the airmesh straps ensure it doesn’t get too hot. The Gregory Miwok 24 is made from durable 100D Nylon, which makes this the perfect pack for all eventualities. From daily commutes, to airport travel or trail walking; this backpack is designed to withstand frequent and harsh use and will stand the test of time. It has a barely-there feel and an expandable helmet pocket which makes it ideal for cyclists, too. Small and compact, the Osprey Rev 6 is by far the best running backpack for hydration. We guarantee this will become your trusted companion when running, hiking or cycling an intense trail as the 1.5L bladder allows you to take small sips as and when you need them. If you want a pack that stays still when you move, this is the one to get. Although very small, this backpack boasts lightweight efficiency like no other. The Salomon Skin Pro 10 Set will be your new best friend if you are a keen hiker. Although not the highest capacity on the list, this bag has something that the others lack - pockets! You won’t be short of places to put things with a carrying system that can hold hiking poles, helmets and any other necessary tools. This running backpack also includes a hydration bladder,whistle and reflective detailing. The Dueter Speed Lite 15 pack is one of the best running backpacks for marathons as it is praised for its weightlessness. It is also ideal for days out and holidays as it has plenty of space for a change of clothes and other belongings as well as the perfect sized pocket for keeping a book safe if you like to read on the go. You’ll also get all your mod-cons including a 2L bladder compartment with hydration hose. We absolutely love the Nike Commuter and believe it is one of the best running backpacks for commuting with style. This pack can take you from the gym to work and on your evening run with a look that simple yet stands out from the crowd. The back panel will ensure you don’t get too hot (especially if you’re wearing a suit). The reflective strip makes this bag ideal for running at night time for high-visibility. Although such a high capacity bag is not ideal for hiking through the forest in the rain, the North Face Surge 33 is ultimately the best running backpack for laptops. So if you’re frequently going on business trips then you need to invest in this bag for the easiest and safest way to carry your laptop. The 26x36cm compartment unzips completely for easy transport through airport security without unloading your entire bag.